Not specified in the Bible verses above, I have set the scene in the late morning. Sunlight (above & behind the viewer) illuminates this scene. Cast shadows fall to the right & behind the figures. In this version the sunlight is weaker, & casts fewer deep, dark blue shadows into the scene. Nevertheless, some shadows fall on this side of the wall, with highlights on the top of the wall, & picking out a few of the wall stones. Jesus the Christ is in the centre of the scene, in blue outer robe & with a white head scarf on. 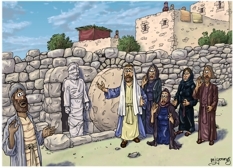 He is commanding Lazarus to come out of the tomb. To the right of Jesus is Martha (standing) & her sister Mary (kneeling), both dressed in dark mourning clothing & looking astonished. To the right of Mary & Martha is Mary Magdalene & Matthew/Levi. I have removed the rest of the characters present (some of the crowd of mourners) which I drew in previous scenes. 01) (Previous page) John 11 – Lazarus resurrected – Scene 04 – Lazarus raised (Version 01). This scene is the “old” one, drawn in 2009. 02) (Previous page) John 11 – Lazarus resurrected – Scene 04 – Lazarus raised (Version 02). In which I have included dark blue shadows across the tomb wall & figures. 03) (This page) John 11 – Lazarus resurrected – Scene 04 – Lazarus raised (Version 03). In this version I have removed the dark blue shadows, allowing full colour. There are cast shadows to the right of the figures & base of the tomb wall. This version is lighter for customers to project on screen &/or to print. The colours of the skin, hair & clothes of Mary & Martha (Lazarus’ two sisters) were establish in Bible Cartoons I drew in March 2009 (e.g. John 12 – Jesus anointed at Bethany) I have used the same colours to maintain continuity in earlier scenes in this series (e.g. John 12 – Jesus anointed at Bethany). However, in the scene above (e.g John 11 – Lazarus resurrected – Scene 04 – Lazarus raised) I have drawn Mary & Martha in dark mourning clothes, rather than their previously established, lighter clothing colours. The tomb rocks & particularly the retaining wall behind the tomb is based on a black & white photograph I found on the internet. The photograph was taken in the 19th century & shows people around the tomb of Lazarus in Bethany. I was keen to draw the rock wall & the tomb entrance rocks accurately.